GLADSTONE — It was a challenging conclusion to round-robin play for the Kingsford Junior Girls’ Little League All-Stars (age 13-14) in the state softball tournament Sunday. Kingsford proved equal to the challenge, however, and posted a 7-3 triumph over Georgetown on this sunny and warm afternoon. The victory enabled Kingsford to earn the No. 2 seed and a bye in today’s quarterfinals. The District 10 champion was scheduled to face Charlevoix or Tri-City North in a semifinal game with the championship contest set for 1:30 (EDT) at Gladstone High School. Kingsford was clinging to a 4-3 lead after 4 1/2 innings, but responded with three runs in its half of the fifth. Talia Wallis gave Kingsford a two-run cushion on a throwing error in the fifth and Bree Raymond’s two-run single to rightfield made it 7-3. Georgetown loaded the bases with nobody out in its half of the fifth, then climbed within 4-3 on Lydia Warsen’s two-out, two-run single to left. Kingsford’s Allie LaVarnway opened the scoring on a throwing miscue in the first and Talis Wallis made it 2-0 on Abby Terrian’s ground out to second. Elsie Norton’s sacrifice fly to left got Georgetown on the board in the third. Kingsford then pushed its lead to 4-1 on Sidney Tomczak’s double to right-center in its half of the third. Kingsford finished with eight hits, including two each by Talia Wallis and Terrian. Tomczak earned the complete game victory, striking out seven, walking four and allowing four hits. Autumn Janowiak had two hits for Georgetown, which was facing Onaway in a quarterfinal game this morning. Warsen, who worked 4 2/3 innings, absorbed the loss. She fanned four, walked one and surrendered seven runs on eight hits. 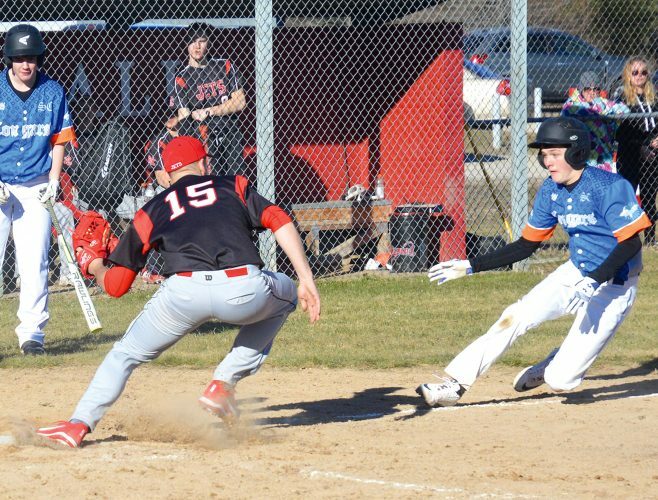 Earlier Sunday, Terrian and Tomczak went 3-for-3 in Kingsford’s 12-2 victory over Tri-City North in five innings. Macy Holmes and Zoie Geronimi had two hits apiece. Tomczak, who went the distance, gave up four hits, whiffed five and walked one. 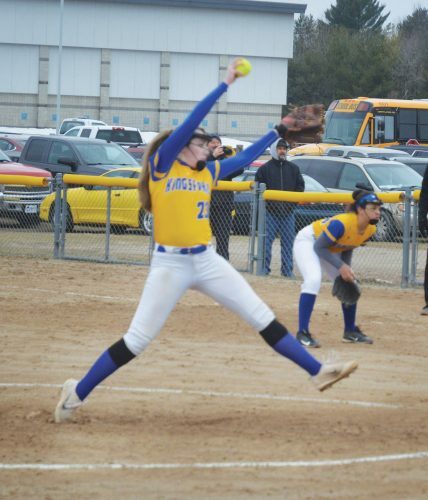 Kingsford opened Saturday’s play with a 20-2 loss in three frames to defending champion St. Clair, then bounced back to beat Onaway 11-3. Tomczak scattered four hits, struck out five and walked one against Onaway. Allie LaVarnway had the lone hit for Kingsford against St. Clair’s Cloie Berg, who ripped three-run homers in each of the first two frames. In other Saturday games, St. Clair beat Charlevoix 11-1. Georgetown clubbed Melvindale-Taylor 13-3. Charlevoix squeezed past Tri-City North 9-8 in eight innings and Tri-City whipped Melvindale 16-2. In Sunday’s remaining games, St. Clair topped Georgetown 10-5. Charlevoix blanked Melvindale 18-0. Onaway romped past Melvindale 20-7 and Charlevoix defeated Onaway 7-3.